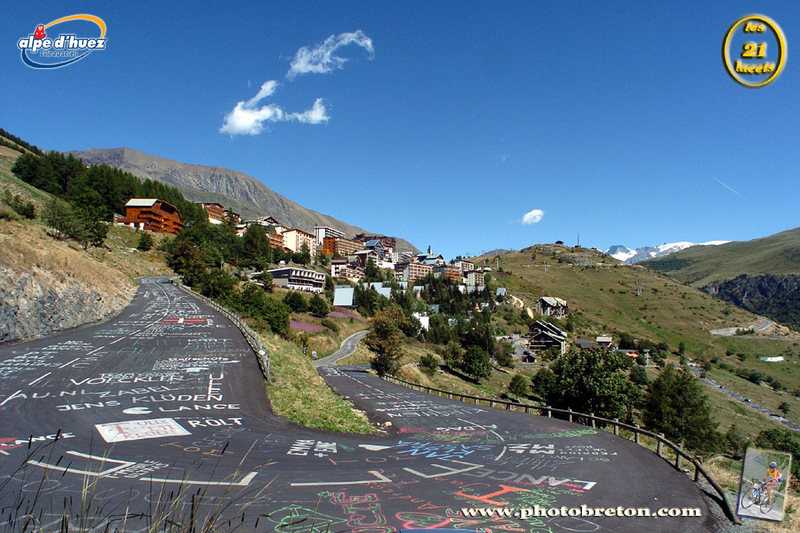 I finally looked up the image that was taken by a commercial photographer on Alpe D’Huez and broke down and ordered a digital copy. The other 2 images are canned that came free with my shot. Today was the 3rd and last day of our Live the Dream package. 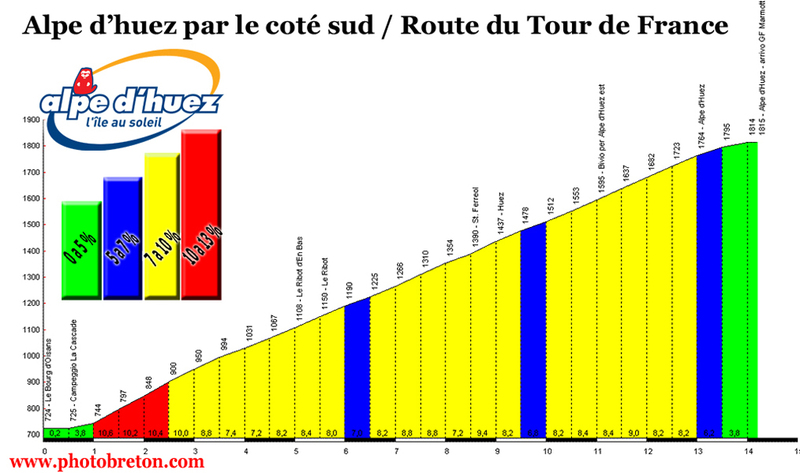 After an early breakfast at the Hotel the riders among us flew down the 21 hairpins of Alpe DHuez. 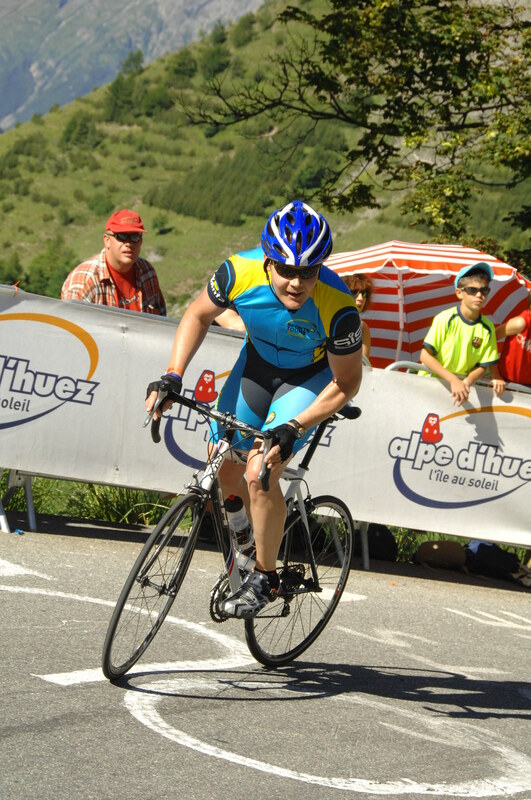 We then rode on to Bourg D’Oisans to enjoy VIP access to the Start Village and riders enclosure. 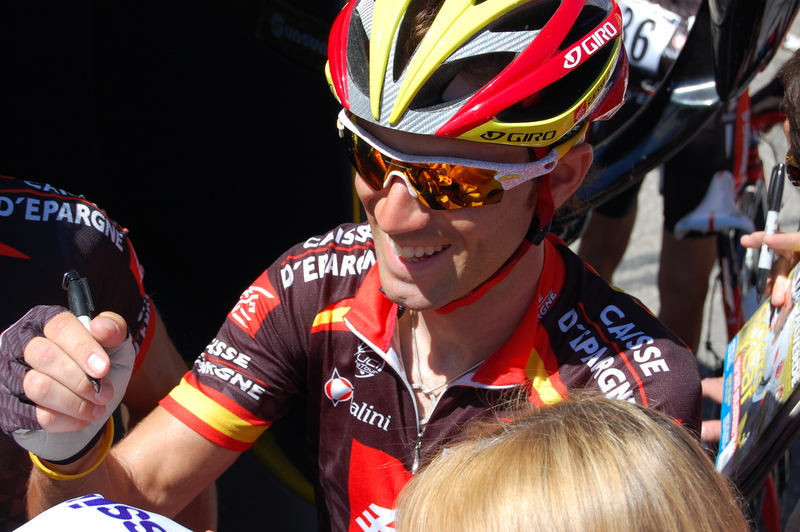 Graham Baxter took us to meet the Caisse D’Epargne team and had Luis Leon Sanchez and Alejandro Valverde sign my jersey. It was fun to be in the area, check out the bikes up close, and see how it all happens before a stage start. The riders have to push their way through an incredible throng to get to the start…stopping to take pictures with fans all along the way. I’m starting this blog 4 days before Myrna and I set off for our dream trip to the Tour de France. We received the itinerary and the riding days are exciting and challenging. I feel like I am ready. Yesterday I hit out on a 65k ride to Horseshoe Bay and felt strong on the climbs, confident on the mini-descents. I felt very within myself…ready to take on the challenge of France in a light-hearted way. How else can you approach riding parts of the scariest stages of the hardest bike race in history? I’ve been steady on the bike the last 4 weeks…3-4 rides per week to get used to being in the saddle. I am finding as the trip approaches that my vanity is starting to show. I now have cycling socks for the first time. My mountain bike shoes from 1985 have been replaced with roadie shoes…the first pair I’ve ever owned. I have matching water bottles (they match eachother, not the shoes…I’m not that far gone). Chief among these vanities are newly shaved legs. I’ll just say that they’re taking some getting used to. Bike insured, bike box reserved, bike tuned. Here we go!